Is there really time in life for self-care? Can you take care of your skin without toxins? Is toxic free skin care and makeup even possible? Self-care for moms? That’s a good laugh. Is there such a thing? Does it REALLY matter what we girls spread all over our face once or twice a day? These are all questions I’ve asked myself over the years and so I share with you a bit about my self-care journey. Breakfast, chores, laundry, laundry and more laundry, diapers, dishes, computer time, homeschooling, weeds, manure, shopping, more meals, more diapers, more laundry… I would submit to you that there would be nothing abnormal about waiving the white flag of surrender and giving up on caring for one’s self. Come on, I’ve wanted to hoist that flag time for two. One less area in life where we have to fight. How easy would it be to simply… give up? My Gramma was a farmer’s wife. Tall, dark hair, lovely, but she confessed she didn’t know much about self-care, skin care, makeup… she spent her days raising five children, in her strawberry patch, driving the grain trucks to the elevator, keeping the farm books. Self-care for moms? I seriously doubt that was on her radar… or should I say, CB radio? Perhaps a good perm now and then and some ponds cold creme. That day Gramma bought us all skin care sets, some foundation and some eyeshadow palettes. We learned how to comb our brows and dress for our “season”. We ALL became totally committed to washing our makeup off, wearing makeup daily, using anti-ageing cremes, OK, so I wasn’t using all that makeup and wrinkle cream at twelve years old but the moral of the story is that self-care became a huge priority for the women in my family that day. At least that’s the way I remember it. As a young woman, I started on a journey of learning how to care for myself and to have the women in my family leading the way, had a profound impact on my commitment to do so over the years. 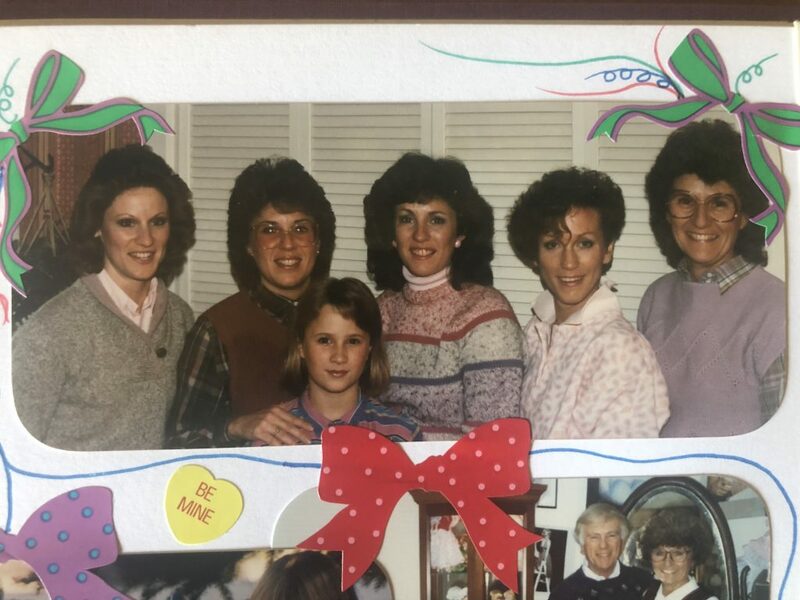 Left to right: Aunt Ruth, My Mom, Me, Aunt Julee, married-in red headed Aunt Ardy and my Gramma. Taken on the day Gramma hosted the makeup & skin care party. I feel very blessed for that. Self-care has always been a priority for me. Yes, I homeschool, live on a farm and go days without interacting with another soul outside of my family. But I’m still me. Angela. I want to look nice. More importantly, I want to feel nice. Even if I’m caked in dirt. Or snot. Or crumbs. I’ve never found a reason to give up on presenting myself. True, my hair contains copious amounts of dry shampoo and I’m known for wearing the same dress ’til it’s ripe but I choose to make an effort via mascara and lipstick and it’s helped me retain a measure of sanity in a crazy life surrounded constantly by seven people who need me constantly. But I have one regret. When I look back on all the toxic ingredients I’ve used on my face and body, in the name of self-care, beauty and upkeep...I cringe. Straight up poison. Hindsight is 20/20. Thank goodness. And in the last couple of years, I’ve had some serious “come to Jesus moments” about anything that I put on my body. So can we just talk about things for a minute? BUT, when I came into this group of “weird” people who would dare have their babies at home, I began to learn about OTHER alternative health methods. I began to grow very cautious of anything that seemed “normal” when it came to health and I made some great changes for myself and my family and I believe those changes have paid off in spades. I cut growth hormones out of our dairy products, I cut GMO ANYTHING out of our diet, I cut back our sugar drastically, I learned to cook real food… But for some reason I never connected the dots with my self-care routine. 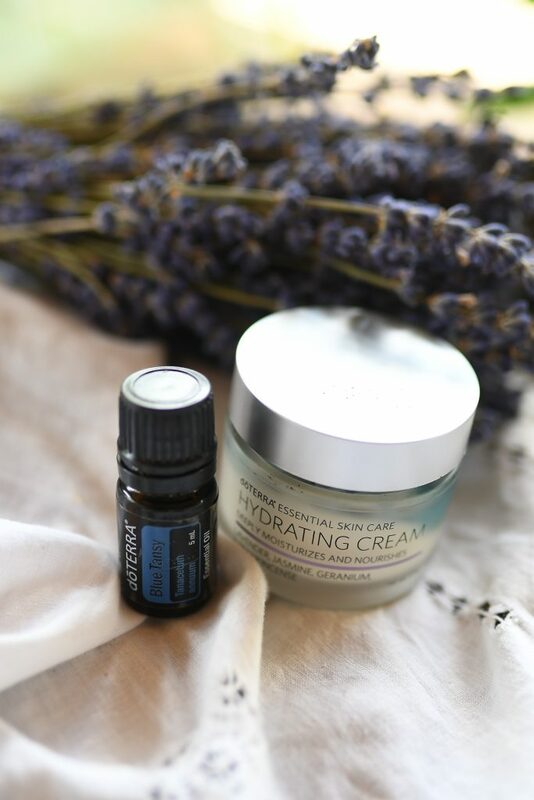 Essential oils for skin care? It’s been FOUR YEARS THIS WEEK so I think it’s worth mentioning as we are celebrating around here. I began with doTERRA Essential Oils four years ago on a bit of a whim. It was the wild west. My fellow blogging friend Shaye called me and said, “You should try this company with me.” and BAM. I tried it. I loved the oils and had amazing results with some thyroid and neurological issues I was having. And what was for dinner? Crow. I had to eat crow. I learned more and more about the garbage that was in the cosmetics I wear every day and as I became more and more knowledgeable about essential oils I began to learn more of what they were really capable of when it came to my skin. I began to connect the dots that if oils work on the cellular level… then DUGH... they could work on the CELLS of my skin. I was dealing with a NASTY pregnancy mask at the time and I was desperate for answers. I looked into Rodan and Fields but when I showed the ingredients list to my midwife she said, “No way.” and that really got my attention. Could there really be a connection between my health and the products I used on my face? OK… I’m slow. I get it. I began to learn what sort of side effects all that crap I was using on my face had. All in the name of vanity. It’s inexpensive and it’s found in a ton of industrial cleaning agents. It’s used in jet engines as a degreaser. Think your skin is sensitive? I wonder why? This is one of the most COMMON irritants in skin care and it’s the first ingredient I became aware of as toxic for my body. It’s in just about every product in all those cute bottles at TJ Maxx. All that pretty packaging contains…. garbage. Cheap, effective and in almost everything you buy for your skin and body. The most common are butylparaben, methylparaben, and propylparaben. From Real Simply.com “In the 1990s, parabens were deemed xenoestrogens―agents that mimic estrogen in the body. “Estrogen disruption” has been linked to breast cancer and reproductive issues. And in 2004 British cancer researcher Philippa Darbre, Ph.D., found parabens present in malignant breast tumours.” YIKES! Here I had been making all these great strides over the years to grow my own food, avoid medications when not needed, eat organic food…. and I’m smearing cancer cream all over my FACE twice a day??? Oh, and parabens are in FOOD too! Yep, last year I found them in my families favourite Mexican tortillas! It’s everywhere! “Fragrance” is a mystery term for who knows what. It covers a variety of ingredients. Just look at all the bottles in your makeup and skin care… not to mention your fragrant lotions. “Fragrance” is a generic term for, how shall I say this? God knows what?! And it’s linked to allergies, dermatitis, respiratory distress and possible effects on the reproductive system. The point I’m trying to make, and I can’t say this enough, is that all these things are hormone disruptors. Our beautiful bodies simply don’t know what to do with this garbage. It sounds nasty right? PG is nasty biz. It’s classified as a skin irritant and penetrator. It is known to cause dermatitis as well as hives in humans. Wait, we use that on dead bodies, right? It may be found in your nail polish, body washes, conditioners, shampoos, cleansers, eye shadows, nail polish treatments. Sigh. Can a girl get a break? Formaldehyde was deemed a human carcinogen by The International Agency for Research on Carcinogens (IARC). Yummy. That’s what I want to smear on my body every day. 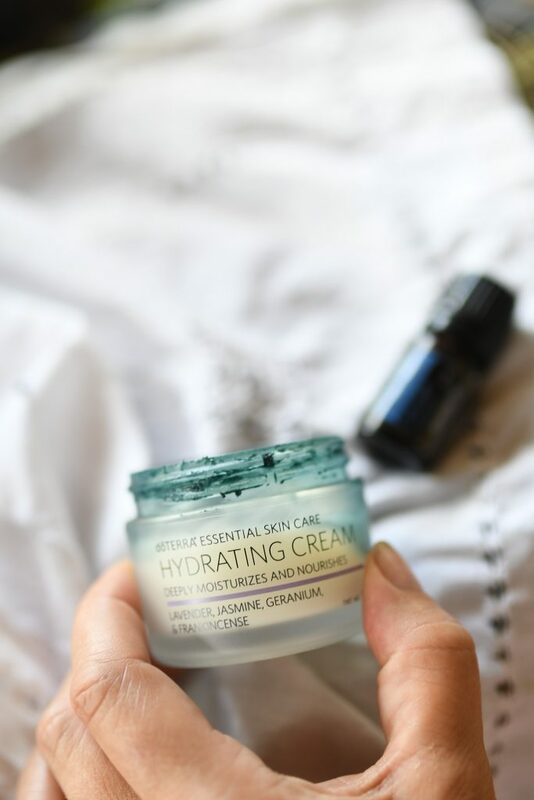 Blue Tansy in my Hydrating Creme is my secret weapon! Well, there are other websites that will say it better than I am. But these are just five ingredients that I know SO many people are using every day in an effort to look great and I wanted to mention them because it’s SO easy to clip along and think you’re doing this self-care right thing. These days I’ve switched to Tarte makeup products because I’m very impressed with their ingredients list. This has been a long weaning process and I still have some garbage to get rid of in my makeup bag. For my skincare, I use a variety of doTERRA essential oils and a variety of their Essentials and Verage Skincare line. I was sceptical for so long. Wondering how MY OWN company could know what they were doing with skin care. I am a self-professed skincare snob and you can read about that here. Again…. eating crow. It ain’t happening. But YOU can make it happen. YOU matter. YOU can carve out those five minutes to care for your skin and throw on some lip gloss. So here’s what I’m going to do since this is a topic I LOVE. 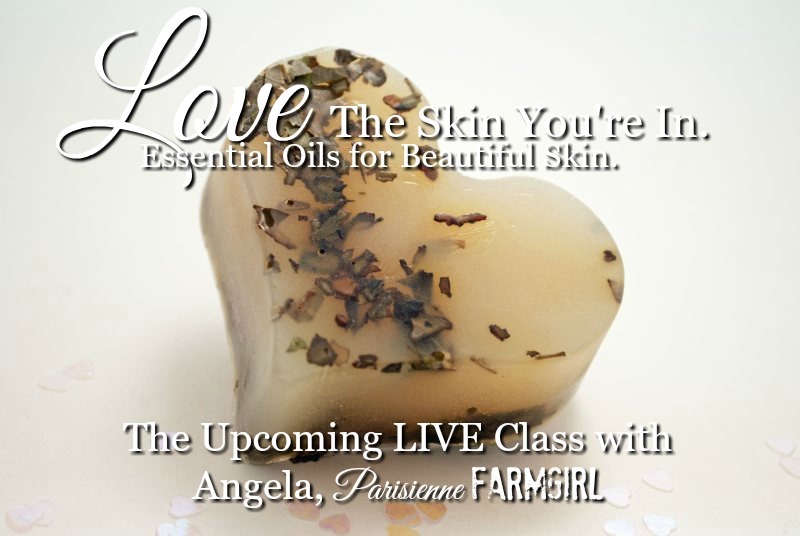 I’m going to teach a LIVE class on Tuesday night with my friend Shaye of the Elliott Homestead. If you wanna come, ALL you have to do is email and tell me. We’re gonna talk skin care and self-care for moms. Sort of like I did on Instagram a few weeks ago. (THAT was a riot, I’m sorry if you missed it.) I want you to email me and let me know you’d like to register OR you can follow the prompt when you leave this page, you’ll have a chance to enter your email address there. Let’s continue this conversation Tuesday evening and if you can’t make it, BE SURE to register anyways and I’ll make SURE you can a recorded copy to watch at your leisure. Even if you’re reading this after Tuesday, let me know and I’ll get you a copy of the class. And now, after a day of manure spreading and masonry work on our “French Fireplace”, I’m going to go wash my makeup OFF and apply some gorgeous, toxic free skin care full of decadent essential oils. 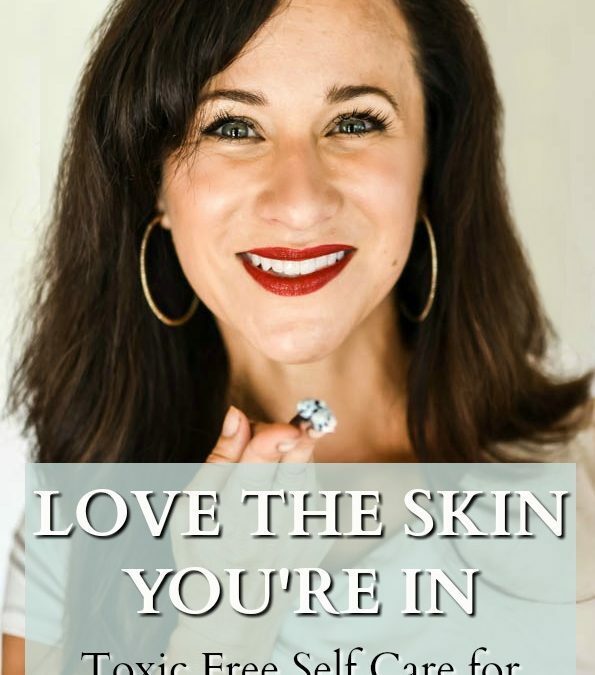 Don’t forget to email me to join my “Love the Skin You’re In” live event. Angela@ParisienneFarmgirl.com. I want to come to the class on Tuesday. Put me on your list please. Awesome post! I have been little by little changing out everything I use over the past several years and makeup was the last and hardest one. I started using Tarte a couple years ago and love it. Hopefully more and more options will become available for people who pay attention to ingredients. I want to be in your class on Tuesday. Is that your grandfather with your grandmother in the lower right portion of your photo? If so, what a handsome couple they are! 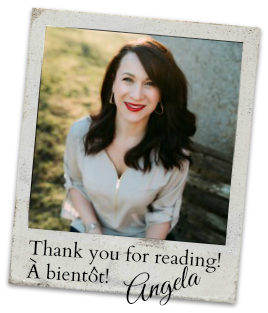 When I tell my close blog friends about your blog, I tell them that you are more beautiful now with 6 children than when I first started following you with–I think it was 3 children! That’s him about 26 years ago. He just turned 90 the other day. He’s amazing. I simply needed to thank you so much again. I do not know the things I would have handled in the absence of those thoughts contributed by you concerning such subject. It actually was a very frightful concern in my view, nevertheless spending time with a specialized form you treated the issue forced me to jump with contentment. I’m thankful for this assistance and in addition hope that you comprehend what a powerful job you happen to be accomplishing instructing many others thru a web site. I know that you haven’t met all of us.